How is the pull force of each magnet determined? All of the pull force values we specify have been tested in our laboratory. We test these magnets in two different configurations. 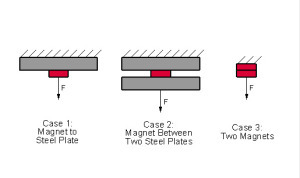 Case 1 is the maximum pull force generated between a single magnet and a thick, ground, flat steel plate. Case 2 is the maximum pull force generated with a single magnet sandwiched between two thick, ground, flat steel plates. Case 3 is the maximum pull force generated on a magnet attracted to another magnet of the same type. The values are an average value for five samples of each magnet. A digital force gauge records the tensile force on the magnet. The plates are pulled apart until the magnet disconnects from one of the plates. The peak value is recorded as the "pull force". If using steel that is thinner, coated, or has an uneven or rusty surface, the effective pull force may be different than recorded in our lab. ← What does a magnetic field look like?